High speed, high impact, high expectations; the pressure was on to deliver an action-packed trailer for EA Sports’ Need For Speed Payback. RTS Award and BAFTA-winning director, Kevin Chapman, and his crew had just one day to film YouTuber, Blackpanthaa teaching British rapper Lethal Bizzle how to drift on the iconic Dunsfold Racetrack. Armed with the concept of bringing the physical and virtual worlds together but with only one day to shoot, everything needed to be seamless and streamlined. No time could be wasted with unnecessarily complex setups and equipment that would enable them to meet the client’s demands. “The shoot was essentially divided into two parts. The first was in-studio filming Lethal Bizzle playing the game, and the second was outside on a runway we used as a racetrack getting the right shots of the drifting McLaren, as well as a number of hero shots of the car,” says Chapman. With two wildly different but equally demanding sets and a fight against the clock to capture the footage, here are the things Chapman needed to consider when lighting this action-packed trailer. Your lights shouldn’t be dictating your schedule. On a one-day shoot, you can’t be wasting time changing gels or waiting for bulbs to cool, there’s just not enough time. Choose lights that aren’t going to limit your creativity or your shooting time — and, with new advances in technology, it doesn’t have to be one or the other. Chapman used a variety of cool-running LEDs from Rotolight to light both the indoor and outdoor sets; the absence of heat being emitted meaning no makeup touch-ups throughout the day and increased comfort for the crew who were all packed into the tiny studio. 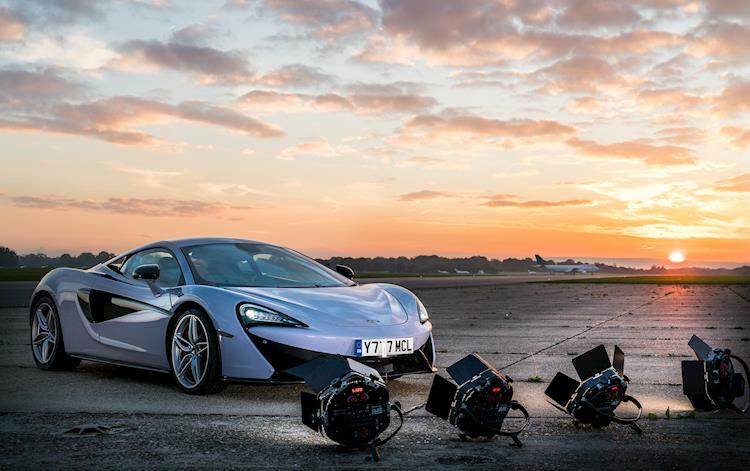 Being able to easily dial the color temperature on the Rotolight Anova PRO 2s and AEOS lights, also allowed the crew to capture perfectly lit and natural shots of the McLaren as the sun began to set with an accurate and easy to read display. With such a limited amount of time to move between scenes, it’s important to be able to move your kit at a moment’s notice. With just one chance to catch the sun as it set, Chapman and his crew needed to move the Anovas to be able to achieve the hero shots needed. “During the outdoor shoot, we used a lot of lights and put them into action quickly. We mainly used the Anova PRO 2s for this part of the shoot and they were brilliant — we popped the light onto the stand, put it in position and the scene was lit in seconds, they’re just so flexible,” Chapman says. With the lights being easy to transport, the crew was able to achieve dynamic lighting effects that otherwise wouldn’t have been possible. Using the integrated aluminum handles of the AEOS, they were able to sweep the beam across the body of the car, attaining the stunning effect of light shifting across the silver McLaren badge. When on a tight schedule, you need equipment that is versatile but doesn’t compromise on power. Rotolight offers a range of flexible, portable LEDs all with adjustable brightness and color temperature, as well as an industry-first suite of customizable CineSFXTM so your creativity will never be limited no matter your schedule.